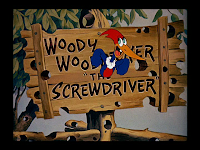 Yep, it's Woody Woodpecker...and for the next month, we're going screwy with Walter Lantz's biggest star. Many cartoon characters evolve, in both physical appearance and in personality, but Woody always stands out to me in terms of character evolution. His appearance changes drastically over the years as does his personality, but that is to be expected when your career spans 32 years. Alongside of Andy Panda, Chilly Willy, Wally Walrus, Buzz Buzzard, Gabby Gator and many others, Woody always stood out as the ultimate instigator and troublemaker. Join me on a journey through the career of the most popular Lantz character. 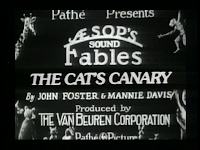 In Van Beuren's "The Cat's Canary", we begin with a grisly scene in which a cat sets a trap to catch birds, succeeds, and eats his prey. The trouble begins for the cat, however, when the only sounds that eminate from his mouth are the chirpings of the bird in his stomach. He quickly seeks out a doctor's assistance. The doctor's treatment apparently involves banging the cat on the floor and smacking his rear, in an attempt to get the bird out. Eventually, the cat gets ejected from the office. 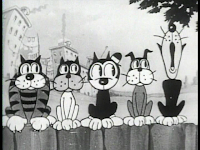 After dealing with lovesick birds, who are attracted to the chirping coming from the cat, he joins up with a group of alley cats, who eventually accept the chirping feline. 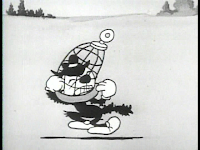 Debris is thrown from a nearby building to silence the cat's tune, resulting in the cat getting hit with a birdcage, which allows the bird in his stomach to escape. The trouble isn't over yet for the cat, as the bird quickly rounds up his buddies, who launch and aerial assault on the feline. The cat is pelted with eggs and even a cannonball launched from the bill of a pelican, delivering sweet revenge from the birds. Yeah, so I was feeling lazy about screenshots tonight. Starting in 1992, Goofy appeared in the tv series "Goof Troop" which paved the way for a feature film, "A Goofy Movie", which spawned a direct-to video sequel "An Extremely Goofy Movie". 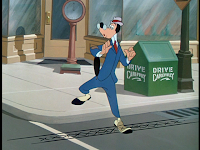 Most of these ventures attempted to stay true to the character of Goofy, while trying to modernize the world he inhabits, but they can't compare to the earlier career of the one and only Goofy. It's been fun looking back over his career. He really is one of the best. So, what's next? Well, as I eluded to in the comment section a few posts back, I think that Woody Woodpecker would be the obvious choice to highlight next, due to the new dvd set. My only misgiving is that the timeline would be not quite complete, as I am missing films of Woody's from the late 60's. So, if you will all bear that in mind, I can put aside my obsessive/compulsion this time. Before we begin however: Sometimes the machinery here at the Acme Factory goes haywire and random cartoons get spit out haphazardly. In between character timelines, you might see posts about cartoons that just don't fit anywhere else. 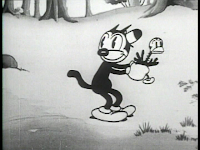 They may be "one-shot" cartoons, or something from the Public Domain Warehouse. I can never know what the Acme gadgetry will crank out, so stop by tomorrow and we'll find out. Since 1987's "Soccermania" has yet to be released in the U.S., I have to move on to 1990's "The Prince and the Pauper". Here we find Goofy co-starring as himself, a good friend of Mickey's. When Mickey switches places with the Prince, Goofy has no idea and overwhelms the Prince with a greeting that the royal mouse is not accustomed to. It is interesting to say that Goofy is quite the hero in this film, since it is he that saves the Prince and Donald from the dungeon. 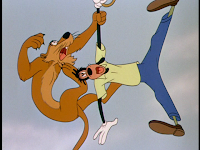 Physical comedy, of course, is abound whenever Goofy is on screen. 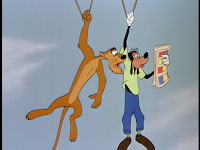 Obviously, this film deserves to be in a Mickey tribute (which is on my "to do" list), but I had to mention it here for Goofy's role in this very entertaining cartoon. 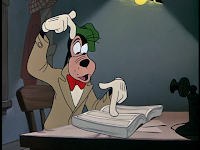 In the featurette, "Mickey's Christmas Carol", Goofy is given the role of Jacob Marley. 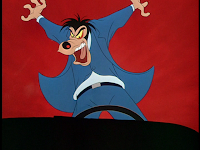 Naturally, Goofy makes the character more amusing than scary. He first appears as Ebeneezer Scrooge's door knocker and gets a nose-honking from his former business partner. 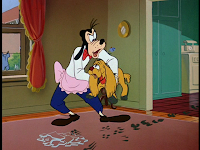 Animated in a transparent blue, the ghost of Goofy emerges in Scrooge's room and promptly trips over his cane. Goofy unknowingly strangles Scrooge with his chains of punishment and tells the miser that he will be visited by three spirits. Of course, Goofy says "three" while holding up two fingers. 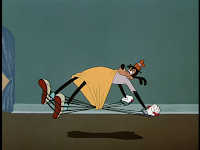 Goofy makes his exit, avoiding the cane on the floor this time, but ends up falling down the stairs instead. This is always a good cartoon to watch during the holidays. 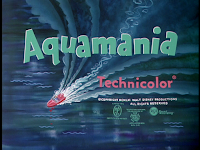 Eight years passed before Goofy reappeared in "Aquamania". Our hero cannot resist buying a speedboat and soon is off to the lake with his son. After sinking the car into the water along with the boat, Goofy straps on the water skis. I never understood why since the only person left to drive the boat at that point would be his young son. 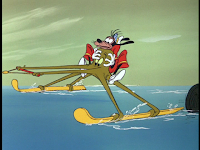 Goofy's oversight of this fact results in his son starting up the boat and getting them involved in a high-speed race. 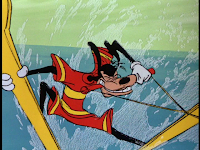 Goofy's skiing abilities (or lack thereof) are put to the test. Goofy is soon tangled up with an octopus while being dragged along the lake and the terrified creature has no choice but to go along for the ride. 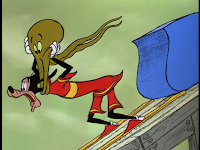 Goofy and the octopus are struck by lighting at one point and are thrown from the lake onto a roller coaster. The hair-raising race ends with Goofy being flung across the finish line and into the winner's trophy, proving that he can still triumph despite his ineptitude. 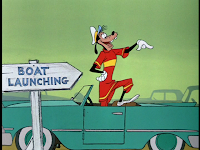 As the Golden Age of animation was drawing to a close, Goofy could always be counted on for laughs. 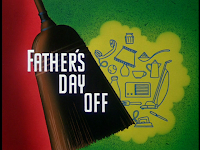 In "Father's Day Off", Goofy is left at home with his son and he scoffs at how his wife makes housework sound so difficult. 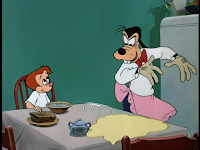 Goofy thinks he has everything under control, but life in the household quickly becomes unravelled. He must deal with his destructive son, a messy dog, an overflowing bathtub and a burning iron. The milkman and the grocery man greet Goofy with kisses (obviously expecting Mrs. Goof). 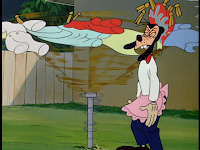 Goofy is oblivious to what these affectionate visitors really signify. While a soap opera is playing on the radio, Goofy drops the phone next to the speaker. Hearing the phony screams and cries for help, the operator believes they are real and calls the police. 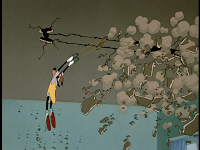 Mrs. Goof returns home just as the police and the fire department storm the house and her husband is knocked out by the iron which has burned through the floor and fallen through the ceiling. 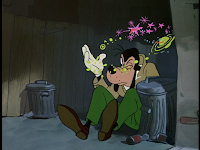 In a crime-ridden city, Goofy is an unlikely detective hired by a woman to find the mysterious "Al". The chief of police (who looks just like Pete, although this cartoon is not listed in Pete's filmography most of the time) seems quite adamant that Goofy leave this case alone. 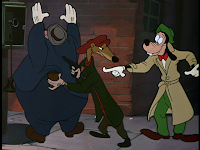 Everyone seems to be trying to stop Goofy from finding Al, including some shifty weasels. 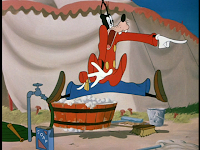 Goofy quickly finds himself sunk to the bottom of the river with cement on his feet and even ends up in the morgue, where he is promptly kicked out and told not to come back "until he's ready". 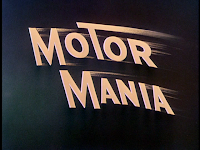 The film shifts into high gear for an energetic car chase sequence full of gags. The mystery of Al is finally revealed. It seems that the police chief is Al and the woman who was looking for him is his bride-to-be. Apparently, the cop was having second thoughts about the marriage and was trying to hide. If only Goofy hadn't been on the case. 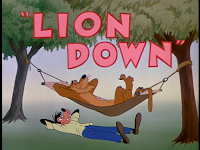 Lots of great Goofy cartoons this year, as our hero deals with fatherhood, gambling and his smoking addiction, but I had to pick "Lion Down" simply for its "cartooniness". 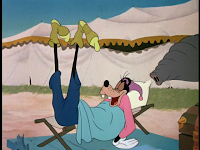 Goofy tries to set up a hammock on the roof of his building, but only has one tree to tie it to. He heads out to the woods and cuts down a second tree and brings it back home. His hammock is now set up and he relaxes in it. Problem solved? Nope! A mountain lion resides in the tree and does not take kindly to being removed from his woodland home. 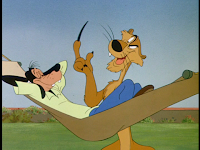 Furthermore, he finds Goofy's hammock appealing. 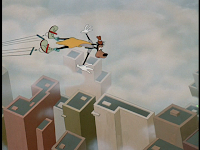 The film is packed with gags such as when Goofy steps out of the hammock while it is suspended across the buildings, he walks on the air for a moment until he realizes his predicament. He is then able to scramble on the air in order to get back to the safety of the hammock. The doorbell that just won't stop ringing, and which brings the action to a grinding halt every time, is a great repeating joke, as is the brief moment of shared laughter by Goofy and the lion at the newspaper comics, before the action resumes. Finally, the lion takes his tree back but leaves an acorn, which Goofy plants and waits for it to grow so he can use his hammock again. All in all, a fun cartoon. Once in a while, a cartoon comes along that deals with an issue we can all relate to. 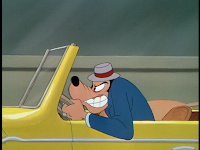 In this case, the issue is road rage and Goofy is behind the wheel. The concept here is that Goofy, "Mr. Walker", is a mild-mannered, good natured civilian, but when he gets into his car he becomes Mr. Wheeler, an aggressive, road-raging menace who is drunk on power. As I said, we can all relate. I have been the recipient numerous times of an unwarranted "finger", but I have to admit that there are other times when I can rage with the best of them. This film really holds up the mirror to the viewer and makes you think about your own actions while driving. The new theme music for the Goofy cartoons helps us understand that this is no longer the Goofy of the past. No more bumbling Dippy Dawg. No more would-be sports star. Goofy is now the common man and his cartoons would deal with the day-to-day stresses in the life of a domestic family man. 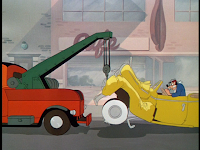 So next time you're driving, ask yourself if you could be a little less like Mr. Wheeler, because the end result is usually the same as Goofy's in this cartoon. 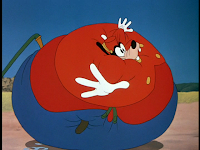 I think it's safe to say that Goofy takes the most physical abuse of his career during the course of this film, the majority of which takes place in the last minute. 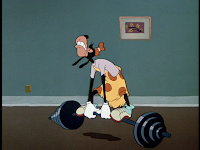 Goofy is now a typical working guy who comes home exhausted, but is inspired to take up a home work-out program. His mail-order home gym arrives at lightning speed and soon he is guided by the recorded voice of an instructor. 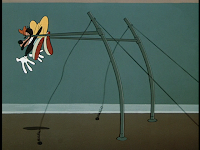 Goofy has nothing but trouble with the barbells and quickly gets tangled up in the chest expansion cables. What results is Goofy's home being demolished as his punished body is flung around the room, through the ceiling and out the window. 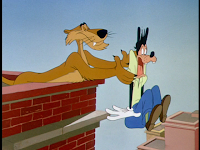 After quickly being admonished by a woman in a neighboring building who believes he is a "masher", Goofy is hurtled back directly through the brick wall of his building. His work-out clearly leaves him exhausted, but not in the way that it should have. 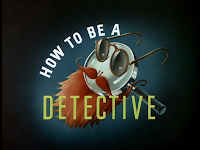 Clips from this cartoon were used in the movie "Who Framed Roger Rabbit". 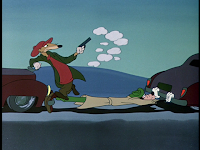 While the cartoon is a good example of Goofy at his best, it is odd for it to be used in "Roger Rabbit", since the events in the movie predate this cartoon. Now I'm being picky though. This is one of my favorite Goofy cartoons. 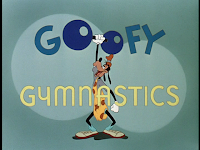 Goofy leaves behind the world of sports to take a job at a circus, where he cares for the elephant, Delores. 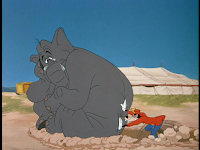 The elephant destroys Goofy's trailer in an attempt to wake him up, but Goofy's a pretty sound sleeper. Once awake, Goofy teases Dolores with the promise of a peanut, attempting to soften her up for what is to come...her bath. 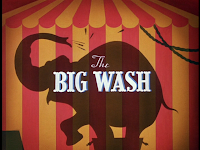 The film revolves around Goofy's attempts to bathe Dolores, resulting in Goofy usually getting more wet than the elephant. Things get even more difficult when the elephant develops a bad case of sneezes, eventually landing animal and trainer in the mud. 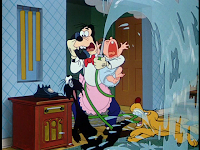 I always love how oblivious Goofy always seems to be to what is happening around him...or to him, such as when the water hose is left running while in his pocket.